Searching to save money for any Lexmark toner? Ordering your Lexmark X646E toner cartridges from Cartridge Save makes it possible for you to start saving a whole lot of time and money. With our affordable pricing in addition to our lowest price guarantee, you'll be certain of receiving the best value offer for your Lexmark X646E toners. It's Cartridge Save's intention to please each and every customer by giving affordable prices along with Lexmark X646E toner which have been manufactured to the highest specifications. Save Money Today On All Lexmark X646E Toner Cartridges! You are able to spend less as a result of free delivery on all Lexmark toner. Spend significantly less and order low cost Lexmark X646E toner cartridges by using Cartridge Save's online store. Cartridge Save an top rated customer support team to ensure that ordering Lexmark X646E toner will be a speedy as well as simple shopping experience. Remember that Lexmark X646E laser printer cartridges delivered by us are accompanied with our cast iron money back guarantee that enables you to claim a 100% refund so customer satisfaction is never far away. We offer one day delivery, solidly built toner cartridges plus the cheapest prices so it makes perfect sense for you to use us for your X646E toner cartridges. Designed for medium to large-sized offices with high printing needs, the Lexmark X646E is a multifunction monochrome laser printer. This unit has a monthly duty cycle of 225,000 pages and quick print speeds. The Lexmark X646E MFP has a maximum resolution of 1200 x 1200 dpi and comes equipped with 256 MB, which can be upgraded to 768 MB. The Lexmark X646E printer only comes with standard Ethernet, and Wi-Fi is optional. The X646E modern multifunction printer features a 20 cm touch screen LCD display, user-friendly function buttons, and a numeric keypad. Above the control panel is the output tray and the flatbed scanner. The paper trays assigned to the Lexmark X646E MFP laser printer can handle 600 sheets, with additional 2 trays, which can be upgraded to more than 3,000 sheets. For connectivity, there are Ethernet and USB ports. The highest capacity Lexmark X646E toner has a yield of 32,000 pages. The Lexmark X646E 4-in-1 laser printer has an impressive print speed of 50 ppm for black and white. This unit delivers good quality output for scans, copies, and faxes. It has an ADF and a duplexer to help save resources. Users will have no trouble operating the Lexmark X-646E mono laser printer thanks to the touch screen display and organised control panel. They can easily share the X646E as it has built-in Ethernet and offers support for Windows and Mac operating systems. 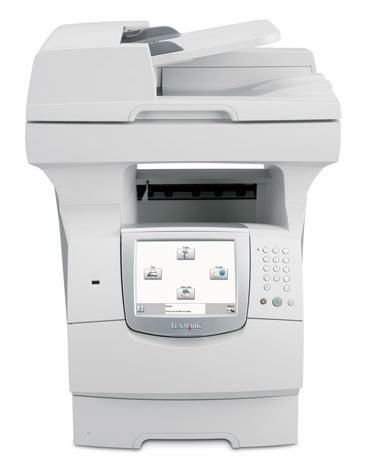 The Lexmark X646E mono MFP only offers optional Wi-Fi and is not standard to the unit. This multifunction printer has already been discontinued.